PF Olsen harvested just over 60 hectares for Bruce Eggers in Moutere. The harvest of Sunset Valley Forest was completed in three stages. There was an earlier clearing of trees around a cell phone tower, with road line salvage then undertaken in 2017 to prepare the block for harvest. Clearfell then occurred from October 2017 to March 2018. Bruce said he selected PF Olsen because of their extensive domestic and export log markets access and solid contractor base. Bruce was impressed with the log market and budget tracking updates provided throughout the harvest. He said the cutting strategy was constantly refined to maximise his financial returns. 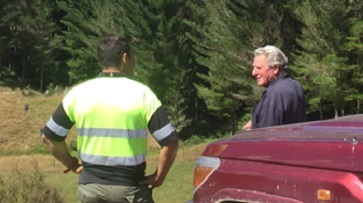 Bruce comments “PF Olsen were right on the ball and managed the operations very well, and the site was left in a very tidy condition that minimised preparation costs for the next tree crop”. Bruce has another 140 hectares of mature forest in Murchison that PF Olsen is now preparing for harvest. Road line salvage harvest operations will start in March 2019. "“PF Olsen were right on the ball and managed the operations very well, and the site was left in a very tidy condition that minimised preparation costs for the next tree crop”."